Facial recognition software is used extensively around the world for various reasons. The FBI is already using it to identify suspects who are caught on surveillance cameras, and the software will no doubt fall into the hands of civilians in the future. Conspiracy theorists and people who like their privacy could simply walk around with ski masks, but that might catch some unwanted attention. An NYU technologist might have a slightly less suspicious, but still pretty attention-grabbing, solution: anti-surveillance makeup that will make your face essentially invisible to facial recognition software. Adam Harvey’s research started out with the reverse engineering of facial recognition algorithms. 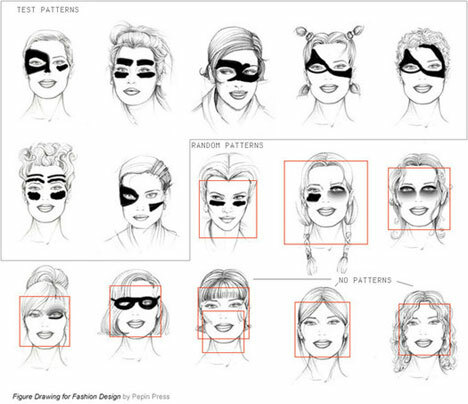 He generated patterns that were more or less visual representations of the algorithms used by the software to identify human faces. Harvey then tried to identify the simplest patterns that could be used on a human face to disguise it. He then laid the patterns over pictures of human faces and ran them through facial recognition software. 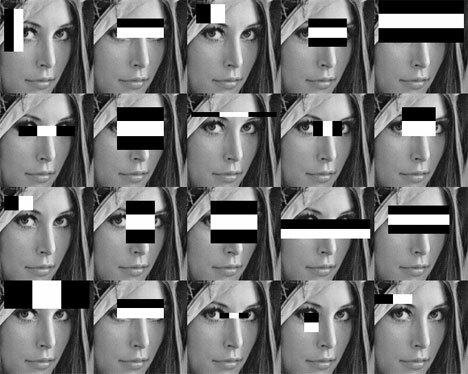 Above, the images with a red square indicate where a face was identified. No red square means the software was unable to identify a human face. The “test patterns” label indicates patterns that were developed according to the research. “Random patterns” indicates doodles made not in accordance with the research. And “No patterns” indicates line drawings with no camouflage patterns applied. Harvey says that his research could be used to develop makeup that would “hide” faces from facial recognition software. By putting dark blocks of color in strategic spots on the face, the software is foiled and doesn’t identify the image as a human face at all. Some of the patterns that foil the software are surprising: they’re small, and the location of the blocks is more important than the size. Beard-like blocks don’t usually work, but disguising the eyes is very effective. Of course, using the theory in real life would mean wearing makeup that looks like it came straight out of Blade Runner – but there are no doubt some people out there who would embrace that aesthetic. See more in Weird Science or under Science. April, 2010.